Every now-and-then, Aldi supermarket have a range of different Ales available and yesterday I discovered a new one called Spill the Beans Coffee Porter produced by Welsh brewery Brains. I love dark beers and I love coffee porters so snapped a few up, and at a quid a bottle, who wouldn’t? I poured it in a glass and Spill the Beans Coffee Porter looked like a porter. Can’t say much more about that. Sadly, Spill the Beans Coffee Porter just didn’t hit the spot for me. Although the flavours were balanced (and could definitely taste coffee and the promised caramel flavour) the beer just lacked body. It felt far too thin on the pallet, I’d even go as far as saying it was watery. Also, as is often the case with bottled ale, it was far too fizzy. In fact, it was so fizzy I felt like it had been carbonated at bottling stage rather than been conditioned in the bottle (which could explain the lack of body). No. OK, so it’s £1 a bottle which makes Brains Spill the Beans Coffee Porter a very cheap beer, but as the old adage goes, you get what you pay for. It wasn’t bad, but compared to a real ale like Colchester Brewery’s Brazillian Coffee porter or the classic Nethergate Old Growler it was miles off. It’s a cheap drink and tastes like a cheap drink. 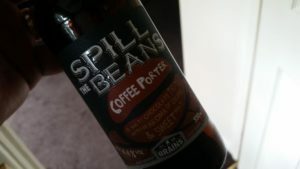 Shame, as if Spill the Beans had taste as good as the label looked it could have been a better all-round beer. But for me it lacked body. You’re wrong. It tastes excellent. . It really doesn’t. Not compared to any other Porter I’ve drunk…of which I’ve drunk countless numbers. All a matter of personal taste. I don’t normally drink “porters” preferring “Golden” but I have to say this is the nicest and best tasting one I have ever tried. Normally with a coffee or chocolate beer all I can taste is burnt beans but this one has a nice chocolate and caramel taste as it states on the label. Highly recommended.